Phoenix’s 1961 Memorial to Arizona Confederate Troops (click for larger image, from Visitor7/wikimedia). In 1961 the United Daughters of the Confederacy presented Phoenix, Arizona with a memorial dedicated to Arizona’s Confederate soldiers. 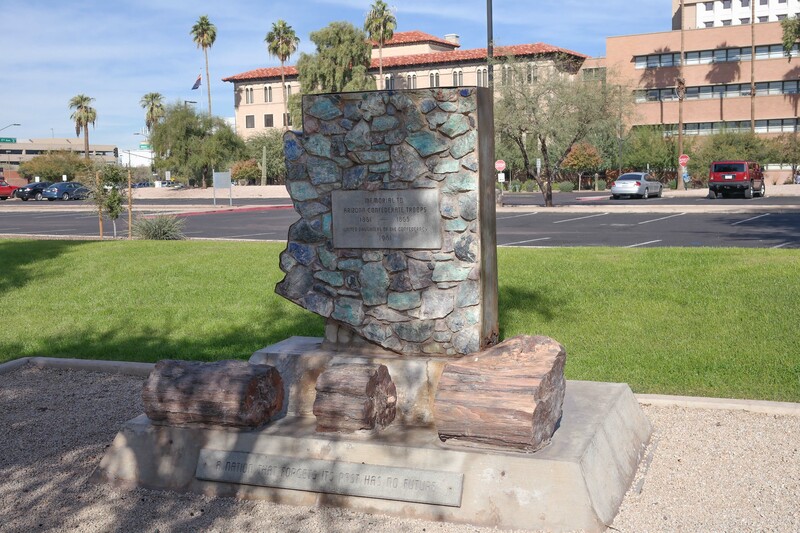 The “Memorial to Arizona Confederate Troops” is a copper ore stonework shaped in the state’s outline that rests atop a pedestal graced by petrified wood. The monument sits on a plaza alongside 29 other memorials at the Arizona State Capitol that range from war memorials to a Ten Commandments monument. The Phoenix Confederate memorial is far removed from the heart of Civil War battlefields and Southern centers, but it is now part of a nationwide debate over the contemporary social and political consequence of Confederate things. 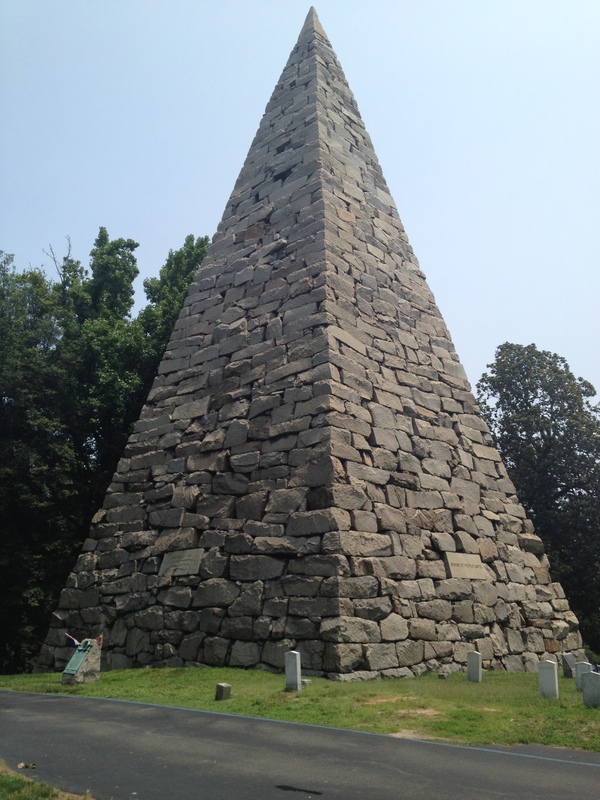 The earliest Confederate monuments were located in cemeteries and included this 1869 90-foot high memorial to the 18,000 Confederates buried in Richmond, Virginia’s Hollywood Cemetery (author’s image). In the pantheon of Confederate things, statuary is perhaps somewhat distinct from the flags, license plates, and assorted collectibles emblazoned with Confederate symbols. Statues and memorials aspire to make timeless sociohistorical statements and define or create memory, capturing idealized or distorted visions of the war that say as much about their makers and viewers as their subject. Yet as time passes monuments routinely begin to appear aesthetically dated or even reactionary. Viewed from the vantage point of the early 21st century, many Confederate monuments are simply documents of 150 years of shallow fantasies of the South and the Confederacy. Some of those public monuments can possibly foster counter-intuitively reflective and sober discussions about the Civil War, which is a century-and-a-half heritage rather than an objective historical event. However, such discussions risk being circumvented by contemporary Confederate defenders who distort the Confederacy’s history and studiously ignore why an imagined Confederate heritage has become so appealing—if not unsettling–well outside the South. While it rarely appears in standard Civil War narratives, Arizona can claim a genuine Civil War history. Swaths of southern Arizona and New Mexico territories were claimed by the Confederacy a century before the monument was erected in Phoenix. A secession convention agreed to leave the Union and become the Arizona Republic in 1861, and in February 1862 it became recognized by the Confederacy as the Confederate Territory of Arizona. Confederates fought under the Arizona banner through the war, but the Governor of the Confederate territory retreated to Texas in July, 1862, and for most of the war the military presence in the region was by Union forces. 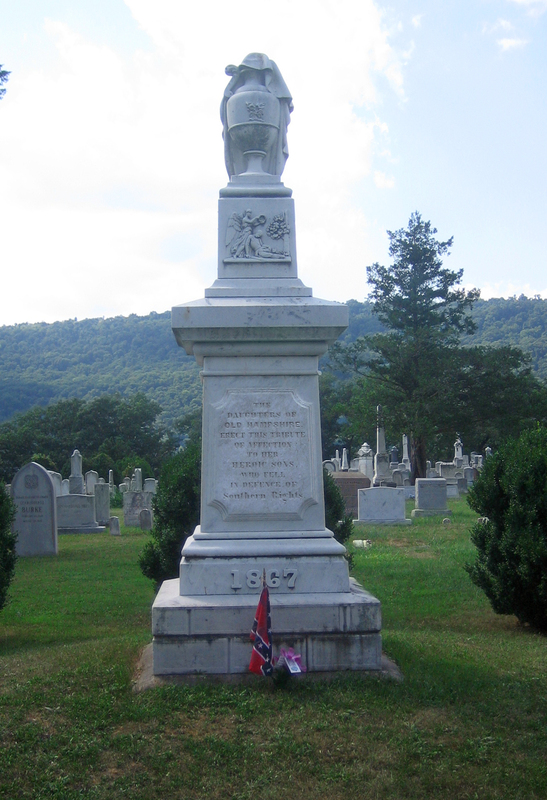 Dedicated in September, 1867, this Romney, West Virginia monument was one of the nation’s first Confederate memorials (Justin A. Wilcox/wikimedia).